An extremely versatile system, it lets you make beats, launch loops, mix like a DJ and a whole lot more no matter whether you’re on stage, in the studio or anywhere between. 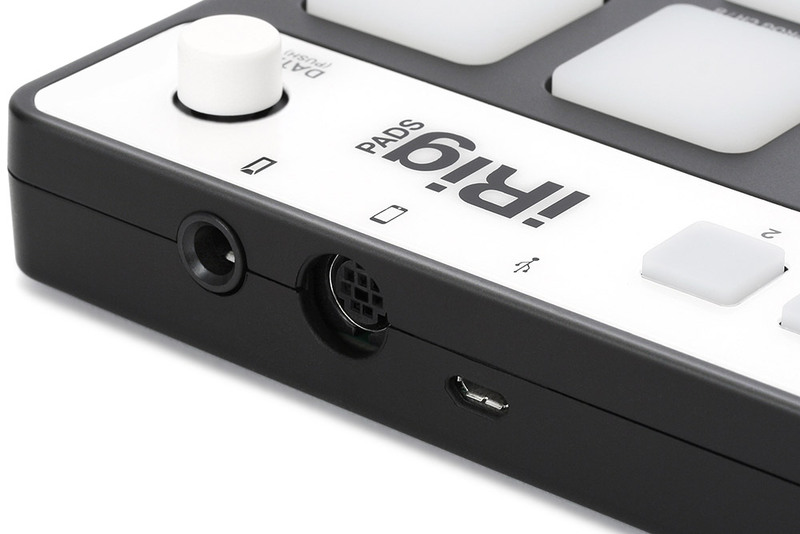 It’s the ultimate travel companion for the mobile electronic music producer on the go. 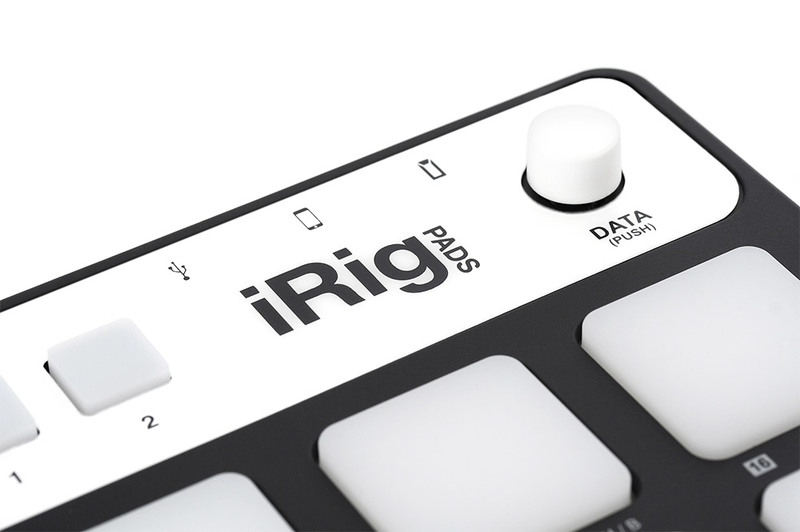 iRig Pads is so portable that you can take it with you anywhere. It’s smaller than an iPad and less than 1” thick (23mm). It features a slim, compact and lightweight design that can be slipped into any backpack or laptop bag and carried around with ease. And for even greater portability it’s been designed with ultra low-consumption, which means it’s fully functional as soon as you connect it into its host device — You don’t need a power adaptor. Just plug it in to your iPhone, iPad or iPod touch via its included Lightning cable (30-pin connector sold separately) or your Mac or PC via its included USB cable and start groovin’. You’ll enjoy incredible tactile control thanks to iRig Pads’ 4×4 grid of 16 velocity-sensitive, backlit multicolor rubber pads. Each pad lights up in multiple colors – red, green, orange and every shade in between – depending on the velocity of your playing and the MIDI information sent by your chosen music app or software. 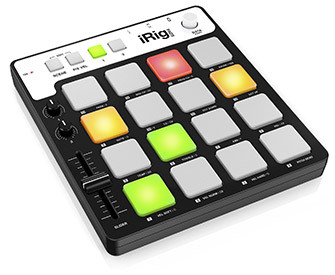 But iRig Pads does more than your average mobile pad-based MIDI controller. Its full set of controls — two knobs, two pushbuttons, one slider and one pushbutton rotary encoder — provides a versatility that lets you be in control in any situation. All controls are MIDI assignable and customizable: Up to 16 distinct MIDI maps or “scenes” can be saved and recalled instantly for full control of apps and software. It comes with 6 pre-programmed default scenes that allow it to work with popular apps and software right out of the box. ** This version of Gumdrops will not produce sound on devices with iOS 8. An update has been submitted to Apple. Thank you for your patience and understanding. iMPC Pro – finally touches down! The normal price for iMPC Pro is $19.99, but for a limited time, iMPC Pro will be available for $12.99, as a way for us to give iMPC users the opportunity to purchase iMPC Pro and retain the value of the investment made in iMPC. Boom 909 integrates one of the most popular drum machines of the 80’s into the modern mobile producers workflow. With Boom 909, getting the classic 909 drum sounds into your music has never been easier. Audiobus compatibility, background audio, and audio export options allow Boom 909 to fit into your music without slowing you down. Personalize your beats with the sound of the 909! Boom 909 provides the superb audio quality found in our other Pulse Code apps. Along with the classic drum sounds, Boom 909 has a built in compressor that is tuned to add punch to your drum beats. Soft saturation overdrive rounds out the signal chain adding warm crunch to your beats. Using Boom 909 with Audiobus allows you to add any number of Audiobus compatible effects as well as record your beats into the app of your choice. 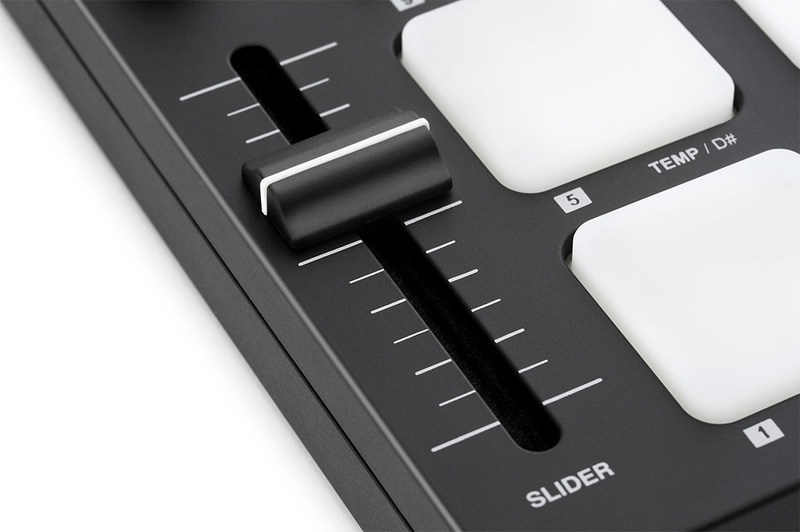 Writing beats is easy by using the internal step sequencer or trigger the drums with CoreMIDI. Control your groove with two swing variations. Drum tuning is complicated, time consuming and sometimes tedious whereas every drummer must face it and learn it. This Drum Tuner helps professional drummers like you master the sounds of your drums accurately and effectively. Specially designed for drum users, the Drum Tuner is professional in recognizing drum strokes. Instead of changing the output frequency ceaselessly like a real time tuner, the Drum Tuner only report a single precise frequency once a drum stroke is detected. With our professional experiences and algorithms in instrument tuning, the Drum Tuner is extremely accurate. It is especially good at tuning your drum lugs to a specified target frequency with the filter mode, which picks only the frequencies that are near your target. It is also possible to show the difference frequencies instead of real frequencies once you have set a target so that you know to tune higher or lower immediately. The Drum Tuner is ideal for tuning drum set, as well. With the favorite drum list, you can save and manage unlimited number of drum settings for later use. And it is very easy to manage and change among the saved drums. Seekquencer… the search for musical perfection! Retro inspired musical sketchpad, beat maker & melody generator – create melodies, drum patterns, grooves, basslines & chord progressions, or just doodle. + Melodic mode – select a scale & never play a wrong note! This is the first version so many more features coming soon. I’d love to hear from you so please leave any feedback and feature requests and I will be sure to consider them for future updates. Beat Motion is a fun groove maker to play, record, edit and mix any kind of sound. It is easy to use, you can import your own music from iTunes or you can record the sounds around you, and create instant grooves everywhere. Do you want create a remix of your favorite song? Just import it in a pad and play. Have you got music Ideas? Just sing or plug in your instrument and record. Beat Motion is also a loop player and a musical instrument to filter sounds like a Wah-Wah effect by your movements. Export your beats and share by email. You can export your songs as compressed or high quality audio. Stroke Machine’s powerful synthesizer engine features high-quality Oscillator, Filter, Overdrive and Effect models, extremely fast Envelopes and LFO, sample-exact Pattern Sequencer and a sophisticated Sample, Sound and Pattern library.